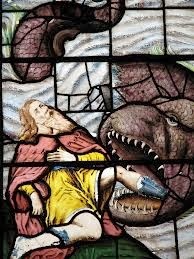 Rethinking Faith and Church: Concerned Over the Collar Size of the Whale? "the Lord provided a great fish"
Years ago, when I was still in Bible College, I remember getting close to completing my educational program. Noticing that I was going to still be four credits short in order to graduate the following spring, I went and spoke to my registrar who confirmed my dilemma. To overcome this problem, he suggested that I find another college that was offering spring or summer intersession classes, register myself for them, and then simply transfer the credits back into my program. He said that so long as it was an accredited college, and since all I needed was electives and not core courses, it wouldn’t matter what I took. I could then graduate in the spring with my peers. His advice made a lot of sense, and so that is what I set out to do. As I began looking through the offerings of the various colleges, I noticed that most of the courses being offered were three credit courses. One course would not be enough, and two would be too many; all I needed was four credits. Then I noticed that there was a local Catholic college offering two, back-to-back, two-credit courses. Without really thinking of the experience to come, I registered. One was a class on Christology, from a Roman Catholic perspective, of course. The other, however, challenged me significantly more. It was called, “Penance and Pastoral Care of the Sick and Dying.” As a Baptist, what was I going to do with that? Still, I needed the credits, and so I swallowed hard, and dutifully went to class. I remember the instructor, a Catholic priest straight out of Rome, saying that I was his “token Evangelical.” As near as I could tell, I was the only student in that second “Penance” class that came to school with a Bible. Come to think of it, I don’t think the instructor even had a Bible on his desk. Consequently, as ideas were being presented, I often put up my hand, while scrolling through the pages of my Bible, to challenge the presented concept or to ask a question. Sometimes I could sense the frustration of my classmates, as I interrupted the lesson yet again. A favorite verse in those days said, “Test everything. Hold on to the good” (1 Thessalonians 5:21). One could, perhaps, almost say that, that was my mantra during those four weeks in the Catholic college. Young people are concerned and some people are worried, they say, about whether we have the infallible Word of God. As far as I am concerned, grant me God Himself, and I am not worried about His writing a book. Grant me Being and Presence of God, and that settles it! I folded the magazine, and laid it down, for that man had come up to bat, but he had struck out beautifully. For I believe that Jonah was swallowed by a whale, not because science has crawled in and measured a whale’s belly, and come out and said, “Yes, God can do that.” If God said that Jonah was swallowed by a whale, then the whale swallowed Jonah, and we do not need a scientist to measure the gullet of the whale. Why are we fussing around finding out the collar size of a whale, or how big his neck is? Grant me God, and you can take care of all the whales! Whenever I find men running to science to find support for the Bible, I know they are rationalists and not true believers! Grant me God and the miracles take care of themselves. “Is healing for us today?” someone asks. My answer to that: “Is God still alive?” And the answer is, “Yes, God is still alive!” All right, then, healing is for us today. Whatever God did and was able to do and willing to do at any time, God is able and willing to do again, within the framework of His will! So what we need to do is get acquainted with God. Now, in an infinitely higher and more perfect and holy sense, it is not whether we can understand it or not, it is whether God said it or not. And if God said “I am,” I respectfully bow and say, “O God, Thou art!” I don’t go running around and questioning God’s ability to do anything. Letting God prove Himself through the channels of our lives is the answer. Grant me God, and the task will not be too big! "Now faith is being sure of what we hope for and certain of what we do not see. This is what the ancients were commended for" (Hebrews 11: 1-2; NIV). How big are some of the tasks or problems that we are facing today? Do we still believe that God is able? Or are we to be counted amongst those whose god is dead, by the way we often seem to turn to everything for our answers, except to Him who is the Answer? Are we to be commended for the same kind of faith that the ancients had? Or have our modern rationalistic minds gotten in the way? Do we really need science to prove God? My Abba Daddy can do anything! How about yours?